A bedtime picture book with a classical feel similar to the author's bestselling Goodnight Moon. From the lost manuscripts of renowned children's author, Margaret Wise Brown, this bedtime story is based on the classic New England Sampler prayer, God Bless the Moon and God Bless Me. The poetic verse of the text reads as if a child is praying for God's blessing on children in different parts of the world and themselves as the moon shines down on them all. 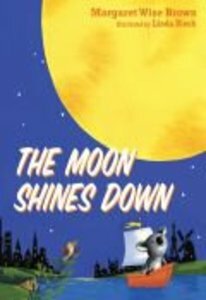 About "The Moon Shines Down"
Margaret Wise Brown--probably most famous for writing "Good Night Moon "and "The Runaway Bunny"--was also a prolific and bestselling Golden Books author. Her "Golden Egg Book," "Home for a Bunny," "The Color Kittens," and "The Sailor Dog "count among the most popular storybooks for children of the last 60 years. Customer Reviews For "The Moon Shines Down"